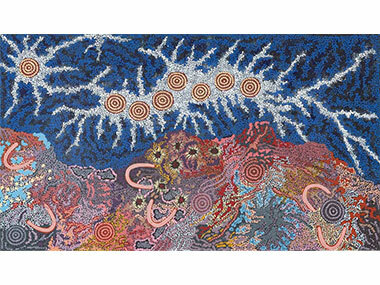 You may recall that the Aboriginal art world got mightily upset in April when it appeared that the incredibly famous English artist Damien Hirst had 'borrowed' more than few visual ideas from the artists of Central Australia who had developed dotting as their chosen way of describing Country on canvas. Hirst – who was selling his stuff in Los Angeles for prices that went well over a million dollars US – denied knowing Aboriginal art. Unfortunately, the Aboriginal Art Directory had evidence that he'd been quoted (quite knowledgeably) on the subject - even if he hadn't really mastered the over-dotting technique that artists such as Emily Kngwarreye and Polly Ngale had at their command. 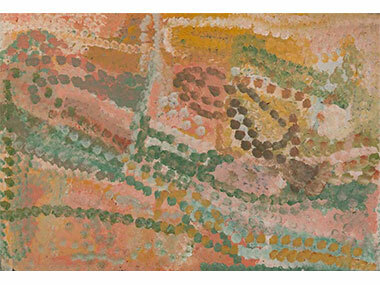 Well, the undaunted Adam Knight, Melbourne dealer and President of the Aboriginal Art Association of Australia, recognised an opportunity to capitalise on this publicity, announcing an exhibition of Aboriginal dotting at the (Tim) Olsen Gruin Gallery in New York. “No doubt many of the bigwigs in town for all the art stars, mega galleries and super-auctions, missed maybe the best secret show in New York at the moment, this six-artist exhibition of Australian Aboriginal women painters — a show that gives us a breathtaking small survey of what critic Robert Hughes (who in almost every case except this I disagreed with) called “the last great art movement of the twentieth century.” Start with the tremendous (1993) Emily Kame Kngwarreye, who started painting in her 70s, but whose strangely structured, still amorphous compositions of smears, dots, daubs, and squiggles create rippling worlds, undergrowth, river scenes, and complex cosmic interior space; and contrast her Rothko-like ruminations to the more detailed, pictorial, and symbolic images created by Gabriella Possum Nungurrayi, and then to a mind-blowing group effort made by a collective of women that looks like a magic-carpet quilt for the spirit. Thanks Mr Saltz; no wonder Adam Knight can tell me: “Review was unbelievable, enquiries gone ballistic, mate. Steve Martin was in gallery and interested in two”. "The problem for the art writer attempting to interpret these paintings accurately has very little to do with acknowledging their intense, self-evident beauty. Instead, it is the need to make sense of symbolic implications in the works, which amount to a real language, however ethereal it might seem to someone unfamiliar with Australian indigenous art. This means that we must intuit the works as best we can, as well as do research into the particulars of the vernacular being used. At the same time, it seems of little practical use to pronounce these works as existing entirely outside our ken. There is a spiritual language that holds sway in this art, and this is recognizable even to those uninitiated to the specific meaning being adumbrated in the paintings. But just as the hieroglyphs were deciphered, so we can make advances into the particulars of what we see. Goodwin’s language is hardly occult, but it is intuitive, symbolic, and spiritual–qualities not much taken up in contemporary Western art!" 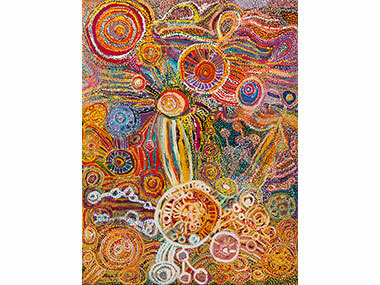 Keep an eye out for some new Gabriella Possum works and Papunya pieces arriving in our Gallery soon.